I never fully understood my mother’s passion for fabrics until I made a trip to Isaan (Northeast Thailand). In her younger days, she spent endless hours browsing fabric shops, acquiring a huge assortment of cloths in a wide range of colors and textures. They filled a large bureau in her bedroom. During her spare time from cooking and being a mom, she would select pieces from her collection and happily sew up beautiful clothes for herself and pretty little dresses for my sister and me. Before I left home for college in America, she made sure I learned to sew and sent me to apprentice with a seamstress. I learned to draw patterns from pictures of dresses I saw in fashion magazines. Though I was able to make myself a wardrobe of new clothes for college, I didn’t really take to sewing with a passion like mother hoped I would. In my youth, I took more to my father’s love of travel and photography. During school breaks and on long weekends, he would take us on excursions to different parts of the country that were just opening up to domestic tourism in the 1960’s. 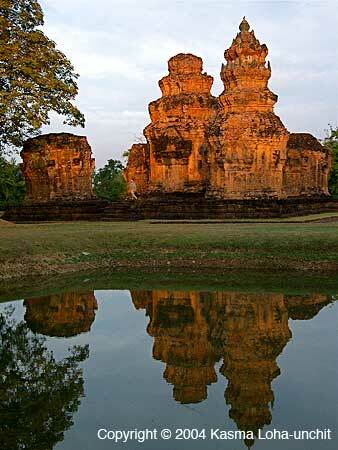 Among the places we visited were the awesome Angkor-era Khmer ruins at Phimai and Phanom Rung in the northeast. 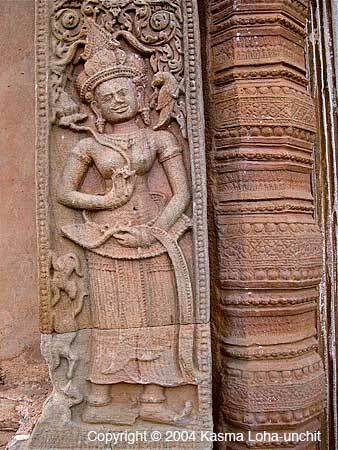 Both have since received World Heritage designation and remain the highlights of any trip to Isaan for first-time travelers. Following college I also discovered and admired several other smaller, but no less inspiring, atmospheric Khmer stone sanctuaries, such as Prasat Hin Peuy Noi in the Khon Kaen countryside and the charming Prasat Hin Sikhoraphum in Surin province with its well-appointed reflecting pool. It wasn’t until a couple of decades later, after I started my home-based cooking school in Oakland, that I decided to explore Isaan’s other hidden treasures. I hired a van and traveled with a few friends from province to province, relying on off-the-beaten-track Thai travel magazines and locals to direct our journey. We drove down many narrow, almost deserted roads to unknown destinations. Soon what consumed the trip turned out to be the seemingly countless weaving villages scattered throughout the northeastern region. As we drove through the countryside, I saw one home after another, in one village after another, where women could be seen weaving in the shade of the open space beneath their wooden house raised on stilts. It was such a contrasting sight that easily grabbed my eye: simple, weathered wooden houses of farming families and brilliant, richly colored silk unfolding from generations-old looms beneath them. 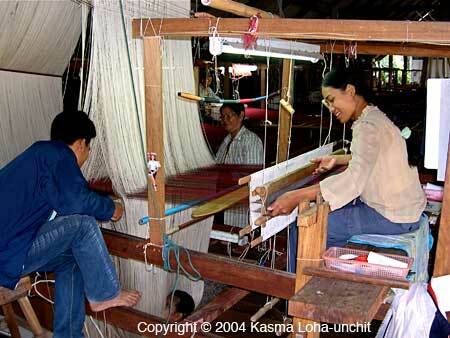 The diversity of ethnic peoples settled in small villages here and there on the Isaan plateau meant a profusion of different styles of weaving producing an abundant array of silk and cotton textiles, each unique and beautiful on its own right. I couldn’t help making stops whenever I saw wooden looms clicking and clacking away beneath the homes in quaint villages. It didn’t take long before I began to fully appreciate the time and effort that went into creating such lovely textiles. The friendly villagers were curious to see us drop by, as few outside people ever did, and most of them were weaving fabrics that they would use to make beautiful traditional clothing for village festivals and to wear to temples for special religious ceremonies. The cloths they were weaving had special meaning in their daily lives. We stopped at several villages which were particularly known for their fine silk and cotton weaving and observed the entire process from start to finish – from silk worm rearing or raw cotton processing to the elaborate process of dyeing and hand-weaving. I soon became captivated by the unending range of colors, designs and textures that I couldn’t help buying the enchanting works of art. Besides, I have a soft heart for helping villagers who’d been so kind to show us around and even shared with us their food at mealtimes. When piece after piece of gorgeous material was unfolded to reveal its glorious detail and lustrous texture and sheen, how could I refuse to show my appreciation for their talent by not acquiring at least one of the pieces? And the lovely children who followed us around with curious eyes and eager smiles made each stop worth every baht I spent. My own textile collection had finally begun and by the end of the trip, I had completely filled a large, striped fiberglass bag with maybe twenty, thirty or was it forty pieces of textiles, ranging from small scarves to four-meter yardage. Many I purchased with mother in mind and she was very happy with the pieces I brought back for her. Some became gifts for special friends and a few were made into skirts and dresses I cherished. The remainder which included some of the most exquisite pieces returned with me to Oakland to hang on walls or live with other precious items acquired from my travels in my bamboo treasure chest. 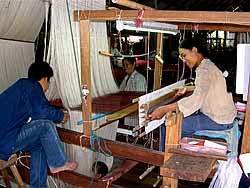 Although weaving is done in small villages all over Isaan, there are several provinces particularly known for their weaving villages. In these villages, a large concentration of people weave textiles not only for their own use during their spare time in between rice planting and harvesting, but are actively involved in producing fabrics for sale to visitors and to send to markets far and wide. 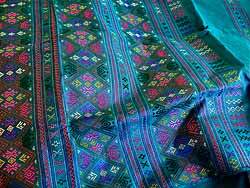 From the villages of Ban Khwao in Chaiyaphum province and Chonabot in Khon Kaen come some of the finest mudmee (Thai-style ikat or tied-and dyed) silk in the country. I have fond memories of visiting both these villages where the people are very warm and friendly. 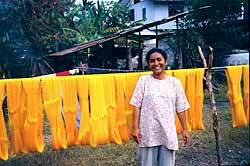 I remember walking around the village with my traveling companions, witnessing all the different stages of silk production. From smiling grandmas and grandpas to teenage children, entire families take pride in their work to make a supplementary income during their spare time from farming. Seeing how silk threads are tied to resist dye before each dyeing is a special treat, adding to our appreciation for all the knowledge of design and color theory and the special care that go into tying, dyeing and weaving to produce the intended results. 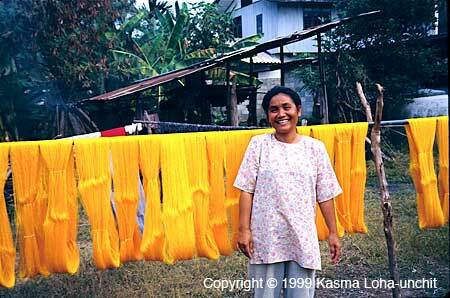 The more colors in a piece of mudmee silk, the more complicated it is to design and make. 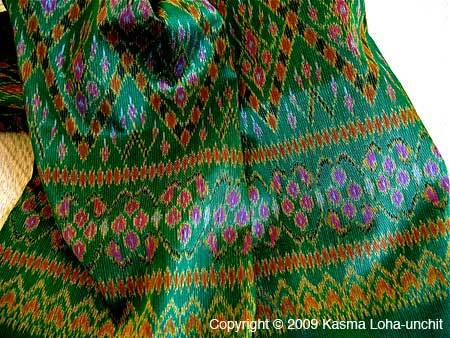 The finest piece of mudmee silk I own is from Ban Khwao. 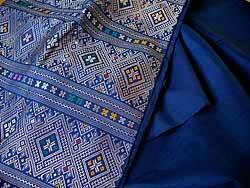 It has especially fine motifs and delicate, multi-colored contrasting borders. It’s simply too beautiful to be touched by the sharp edges of scissors. 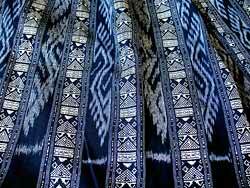 The mudmee silks in Chonabot are equally exquisite though the feel and designs are noticeably different. After having seen and felt dozens of pieces of mudmee silk from these two villages, I think I can pretty much tell from which village a piece of mudmee originates when I see it in a shop in the city. Each village does have its signature style. One of my favorite weaving villages is Ban Poen in Kalasin province, home of the unique “praewa” silk It’s a small village of the Phu Thai ethnic people. I remember on my first trip there we drove for a long while on narrow and somewhat winding roads through open hilly country before we descended onto a small village in the middle of nowhere. It certainly was a treasure of a find. These days, the road has much improved as the same route now takes you to the world-famous dinosaur excavation site and museum. Sirindhorn Museum (named after our beloved crowned princess), opened in 2007, has recently become one of Thailand’s top ten destinations, though 95 percent of the visitors remain Thai and only a handful of foreign tourists venture out to this remote area. 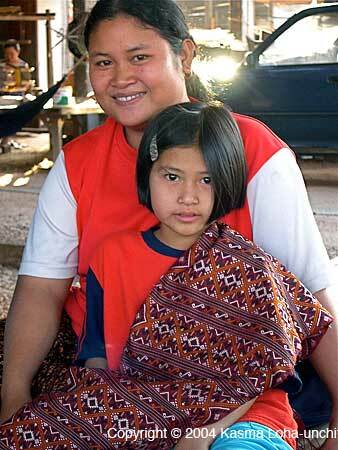 I have a particular affinity with the Phu Thai people of Ban Poen. Perhaps it’s because of their warmth that is so welcoming and make me feel at home. Perhaps it’s the adorable children who come out with their mothers to greet us and who sit beside them when they weave, learning to become the next generation of artisans. Perhaps it’s the unique “praewa” silk that is produced here and which I’ve long admired whenever I see members of the royal family wear it with such elegance. 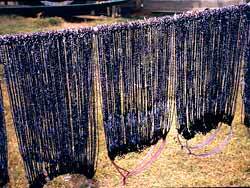 It is aptly called by some as the “Queen of silks” and has acquired both domestic and international fame. 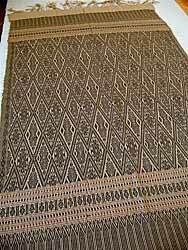 I hear that a patent has been applied (and maybe already granted) for praewa silk to preserve this age-old weaving technique of the Phu Thai. 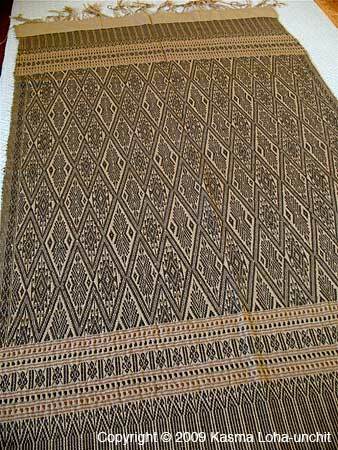 Traditionally, Phu Thai women weave praewa as a shawl (sabai) that is draped across one shoulder and as a headdress or hood worn for special ceremonies. For sure, the entire village is radiantly dressed in their traditional praewa clothing for their festive events. Praewa is part of an age-old living culture that will continue to thrive in the modern era as deserved recognition is awarded to it for its exquisite excellence. My first visit to Ban Poen was truly unforgettable. 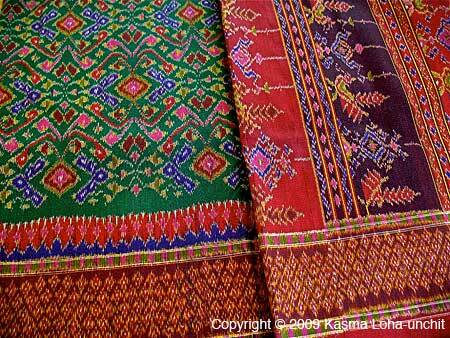 The women proudly brought out remarkably beautiful pieces of silk to show us on old wooden tables beneath their homes. Some were for sale while others were superb masterpieces reserved for their own ceremonial use or that were in the process of being completed as gifts to members of the royal family. 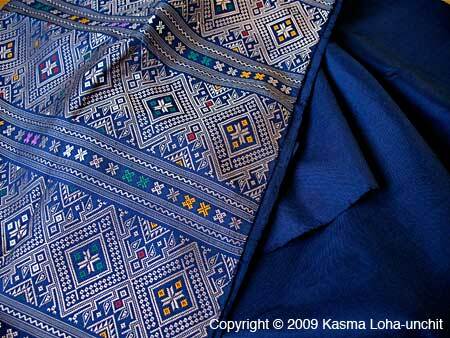 One woman eagerly unfolded a long piece with elaborate panels of intricate, raised designs, each unlike the others. It was almost five meters long. Her 17-year old daughter had been weaving it for over a year to enter in the Queen’s textile contest. I was very impressed and touched by the talent of this shy and humble teenager. She created each panel on the piece spontaneously, each telling a story either about herself, her village or their culture in symbols. It was quite a breathtaking work of art. I found out later that she did win the coveted Queen’s award for excellence in weaving, which she much deserved. 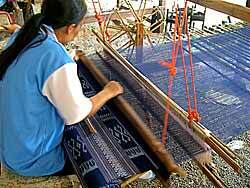 Another province renown for silk weaving is Surin in the lower northeast bordering Cambodia. 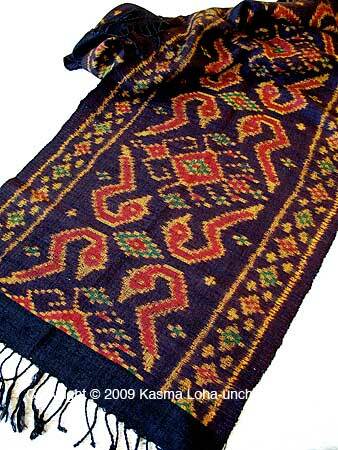 There are several weaving villages not far from the provincial capital. Here the textiles incorporate Khmer designs and motifs and some have pronounced imagery of people and animals. Rich dark browns, yellows and warm reds and oranges are combined in textural background weaves to yield cloths unique to this area. Currently, the most popular weaving village in Surin is Thasawang, from which comes some of the most magnificient silks the world has ever seen. Although it is touted as the largest silk co-op weaving center in the country, unlike traditional weaving villages where women weave cloth for their own use in their own homes and make extra pieces to sell for supplementary income, the weavers here are paid a daily wage and weave extraordinarily fine cloths fit for kings and queens that they themselves can only dream of owning. The village was conceived by a teacher who gathered together weavers from many villages in the area to share and preserve knowledge of different weaving techniques and collaborate on producing ever finer grades of silk that each of them cannot produce on their own. The central government was persuaded to fund the large, two – to three-storey, open-air buildings where weavers could work to create masterpieces to deliver to the affluent in Bangkok and the world. Unlike weaving villages that have been around for generations and represent the crafts of particular ethnic peoples, Thasawang came about only recently, within the past 10 to 20 years. i believe it was set up also as a workshop for the teacher to instruct others on ancient weaving techniques and to showcase the teacher’s own work. While I love the human element in visiting traditional weaving villages where weavers own their work, Thasawang, nevertheless, is a most fascinating place to visit. It is a heaven for textile lovers. Some of the looms are as tall as two storeys. 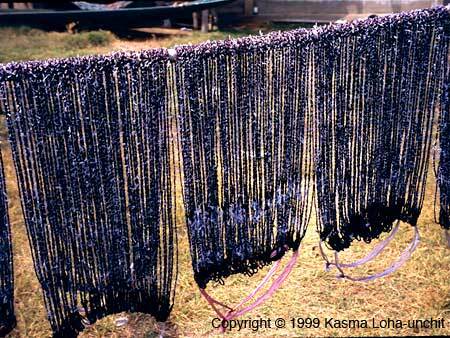 Some are specially made to weave particular pieces of silk and are dismantled after the pieces are completed. Miles of silk threads are strung on the looms and it’s a wonder how they are kept from entangling into a strangling mess. Some pieces of fabric employ such complicated weaving processes that four or more people are required to work the loom to weave only a few centimeters a day of the most extraordinary silk the world has ever known. It;s quite a sight when all four are involved in sorting out threads, with one of them sitting in a pit or on the floor beneath the main loom with a mass of silk threads draped in front of her. Here, too, you see young men involved in helping the weaving process, which tells me that they are specially trained for the work and most likely not traditional village weavers. 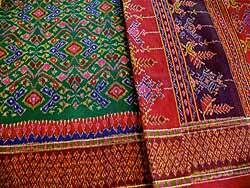 Though silk is highly regarded as a treasure of Isaan, there are much more cotton textiles woven in the region than silk. 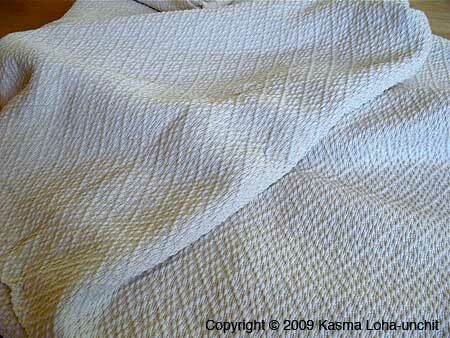 The Prae Pan women’s group in Khon Kaen makes heavily textured, raised designm reversible cotton cloths in warm natural colors. They are woven into blankets, tablecloths, napkins, placemats, table runners, wall hangings and yardage lengths for making sarongs and skirts. Practical and for everyday use, I find these textiles just as attractive as silk and classy in their own special way. 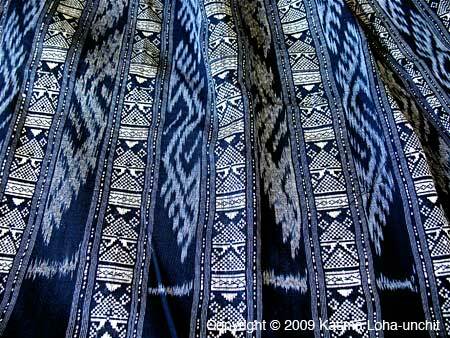 Other well-known cotton textiles of the northeast include the “khit” pattern fabrics of Udon Thani province and the cotton cloths of the Phu Thai of Renu Nakhon in Nakhon Phanom. While silk is breathtaking to behold, I wear much more clothes made from Isaan cotton textiles. They come in simple mudmee design, plain pastel colors, in stripes and a combination of mudmee alternated with raised-design weaving much like embroidery done on the loom. I adore their simple beauty and admire them just as much as the magnificent silks that garner more press and attention. 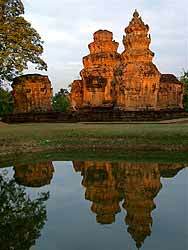 So if you are heading to Isaan for the first time, be sure to include a few weaving villages in your itinerary – in between visits to the Khmer ruins, national parklands with unusual, weathered rock formations reminiscent of parts of the American Southwest and, if you like pre-history, the excavation sites of ancient civilizations and fossils of dinosaurs and other prehistoric animals. 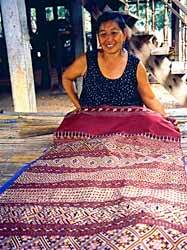 These are the treasures of Isaan and, to me, the weaving villages breathe the life of the country’s heartland where you meet wonderful people in their surroundings and can take home a piece of Isaan to remember your journey by. 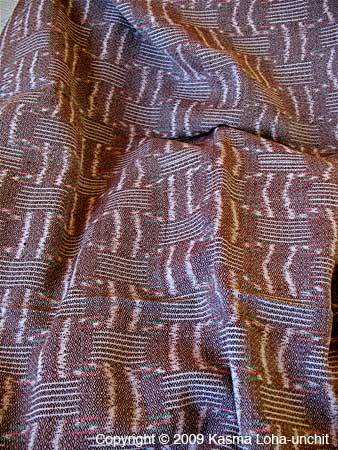 See also: More pictures of Northeastern fabrics. Kasma is leading a trip to Northeastern Thailand from November 30 through December 20, 2009. You can see pictures of NE Thailand from her trip. 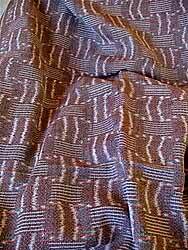 Tammachat Natural Textiles features fair trade textiles, including some from Prae Pan. There’s Article by Pichaya Svasti: Weaving A Way of Life: In the Northeast, women find strength, merit and status through textile production. Heres the website of the Thai Textile Society. Written by Kasma Loha-unchit, May 2009. In nearly every market in Thailand you’ll find a display of roast pig for sale such as this one, photographed at Or Tor Kor (or Aw Taw Kaw) Market in Bangkok – It invariably has the skin on, crispy from the roasting; next to the skin is a good sized layer of fat before you get to the meat underneath. It’s sold by weight. If you get the smaller, bite-sized pieces (such as in the lower center), it’s placed in a plastic bag and you’re given a sharp, long skewer to use to stab a piece and also a smaller plastic bag of chilli-dipping sauce. 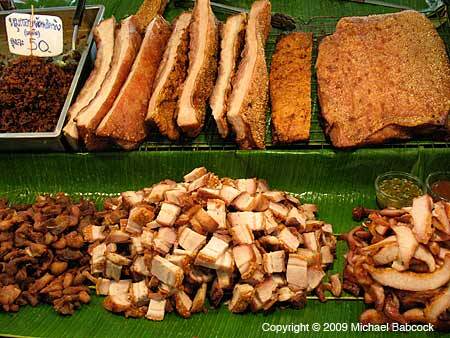 Thai people, like most Asians, love pork. Or Tor Kor (Aw Taw Kaw) Market in Bangkok (near Chatuchak Market) is a fabulous market, well worth a visit (don’t eat beforehand). You can read our previous blog entry on Pad Thai at Aw Taw Kaw (Or Tor Kor) market. 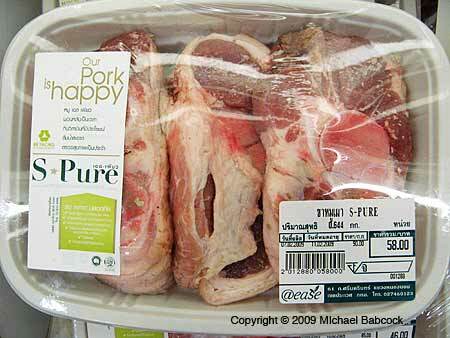 This photo continues with last week’s pork theme. 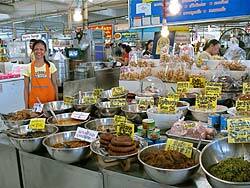 For many people, shopping at Asian markets is a necessity: in order to cook Thai food, you need fresh, appropriate ingredients and they very often are only found in Asian markets. I’d like to make some suggestions about how to go about finding those Asian ingredients when you need them back in the U.S.
You first need to start with a slightly different mind-set than you use for shopping in a supermarket. 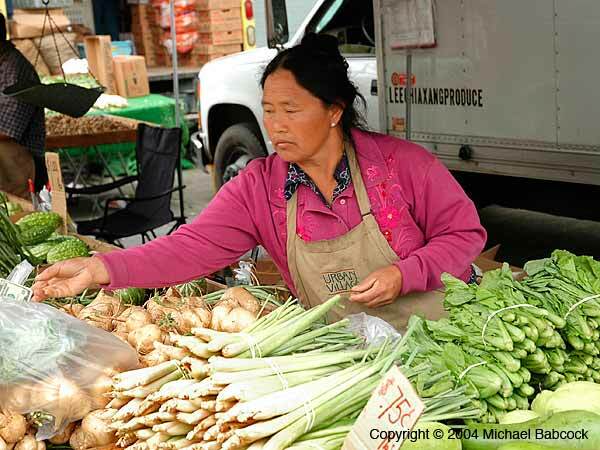 Asian markets vary greatly in how much of different ingredients they stock, which ethnicity is emphasized and whether or not they have produce, meat or seafood. 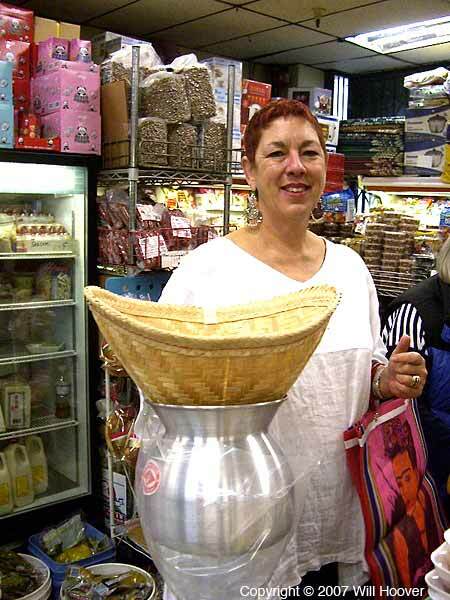 When Kasma shops for her classes, she’ll typically visit at least half a dozen markets. 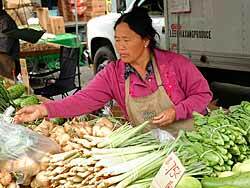 She’ll start at her favorite, one that has a good base of ingredients (Khanh Phong market on 9th Street in Oakland, CA). She’ll usually then visit 2 to 4 other markets in the Chinatown area. After that, she’ll head off to the International District where she’ll complete her shopping: International Blvd. 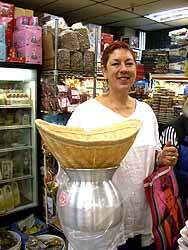 has two especially good ethnic markets (Sontepheap Market at 1400 International Blvd. and Lao Market at 1619 International Blvd.) that she relies on for harder to find Thai ingredients, such as kaffir lime leaves and holy basil. Another market that often requires a stop is Sun Hop Fat (501 E. 12th Street) – it’s another very well-stocked market that also sells fish and seafood. She often also makes a special stop at a fresh fish market in her travels, as well. The reason for all the stops are multifold: maybe a fresh ingredient doesn’t look very fresh at one of the early stores; maybe she needs fresh bamboo shoots and several markets don’t have them; maybe she can’t find the right size of frozen shrimp. And on and on. When shopping Asian, I suggest that you start off realizing that it’s not one-stop shopping, although you may be fortunate and have a fantastic store that has everything you need. Plan on spending a little time to get the best ingredients. If you plan to cook Asian food on a regular basis, take a day and visit as many Asian markets in your area as you can. Learn which stores have which ingredients. You can also see if there are any markets listed on our website. We have one page for markets in the San Francisco Bay Area and another for markets throughout the rest of the United States. 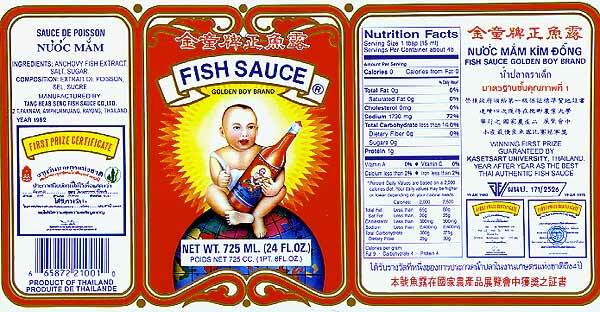 You can also try Thai Table’s Asian Market Locator. Once you’ve got your list, visit every one of the markets. Take notes: which markets have what ingredients, which markets have meat, fresh fish, frozen foods, and so on. Then you’ll have a good idea of where to go when you need certain ingredients. Look on it as a fun adventure. When I shop in Oakland’s Chinatown, I can feel like I’m no longer in the United States. I’m often the only Caucasian in a market, surrounded by Asian people and Asian ingredients: it’s the closest I get to being in Thailand when I’m at home. I’d also suggest that you check out Kasma’s list of her favorite Thai brands. (There’s also a one-page PDF print out available.) When you visit the markets, check to see which have these brands. If you are unable to find them locally, consider purchasing them from an online market. 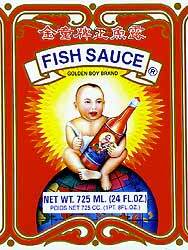 Through the years many students have commented how much of a difference using Kasma’s recommended brands made in their cooking: you’ll especially want to make sure you have a good brand of fish sauce (nahm bplah), such as “Scales Brand” (Tra Chang) or Golden Boy (Dtra Dehk). Check out the three markets on our online market listing. So do take a day and survey Asian markets in your area. It’s a fun excursion and will set you up for cooking great Thai (or other Asian) food. If you don’t know what to cook, check out Kasma’s recipe index for some ideas. For some of the various things you’ll find at Oakland’s Chinatown markets, check out Anita Crotty’s Flickr photo set Oakland Chinatown with Kasma. 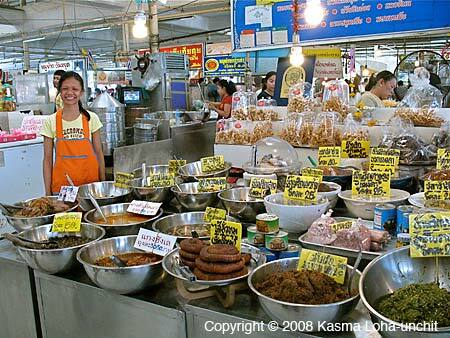 If you have a favorite Thai market in your area, please contact Kasma and we’ll add them to our list. If you send us your comments and impressions, we’ll hopefully add those as well. Written by Michael Babcock, May 2009. I took this picture this last year in Thailand at a supermarket in Seri Center in Bangkok. There are too many malls in Bangkok to count: Seri Center (now called Paradise Park) is one of them. They seem very popular amongst Thai people – I think that they enjoy going there because they are air-conditioned. The only place in Thailand that I’ve really seen the equivalent of an American supermarket is in a mall: they all seem to have one on the very bottom floor. They are as appalling as the American equivalent, with aisle after aisle of non-food, things such as soft-drinks and packaged foods. 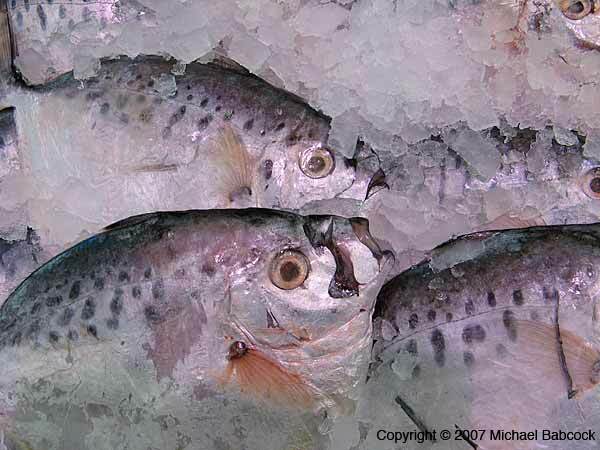 Most of them do, however, have very appetizing looking fresh food and often very good, fresh fish. I took this picture because of the sign on the package “Our pork is happy.” I found it interesting that the healthy food movement, natural meat without antibiotics, has found its way to Thailand. There were also organic eggs at this market. 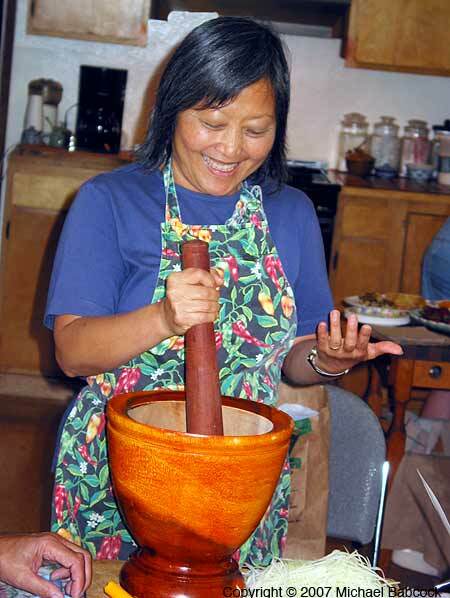 The mortar and pestle are essential tools in Thai cooking. Crushing the fibers of herbs releases the full range of essential oils they contain and give chilli sauces and curry pastes a greater breadth and depth of flavor than just chopping them in a food processor can achieve. This is especially critical when working with fibrous aromatics and roots, such as lemon grass, galanga and kaffir lime peel; they appear dry when chopped, but reduce to moist paste when pounded. Also, when these herbs are pounded together, their flavors meld into one, yielding an immensely aromatic paste in which the parts are inseparable from the whole. If you are not interested in making curry pastes and the extent of the pounding you wish to do is to make simple dipping sauces, a less substantial mortar and pestle set will suffice. You may already have a marble one in your kitchen, which is sufficient for crushing small amounts of the softer, wet ingredients like garlic and chillies. 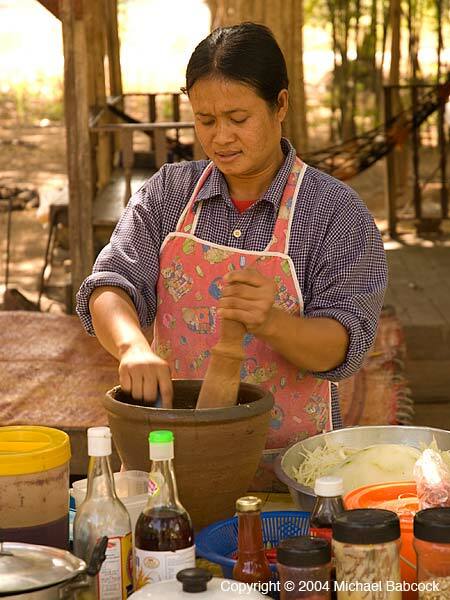 If you don’t already own one, purchase a Thai-style, baked-clay mortar with hardwood pestle from a Southeast Asian market. It is inexpensive (under ten dollars) and both the mortar and the pestle are much larger than the marble set, making pounding easier and faster. The dark brown mortar comes in two different shapes – one deeper and more bowl-shaped and the other with a noticeable molded-in stand and a wider, denser rim around the top. Because both are tall and deep, they keep the juice from the wet ingredients from splattering all over the place; and when you’ve finished crushing them, the lime juice, fish sauce, sugar and whatever remaining sauce ingredients can be added right into the mortar and stirred with the pestle until the sauce is well-blended. For faster results without compromising flavor, chop or mince the ingredients ahead of time. This is where an electric chopper or processor can help out. (Lemon grass should be trimmed and sliced with a sharp knife into very thin rounds to break up the fiber that runs lengthwise.) Then, work one ingredient at a time with the mortar and pestle, starting with the dry spices. They are easily pulverized with a rolling motion of the pestle around the bottom and sides of the mortar while its surface is still dry. The dry ingredients, of course, may be ground ahead of time in a clean coffee grinder designated solely for spice-grinding. However, when grinding just a small quantity in the grinder, the spices often do not get very fine and need to be further reduced in the mortar to a fine powder. Remove the ground spices from the mortar before proceeding with the most fibrous of the herbs. Pound one ingredient at a time, a small amount at a time, moving from the firmest and most fibrous to the softest and wettest. When each is done, remove from mortar before proceeding with the next. Herbs reduce more quickly when pounded with a sturdy, straight up-and-down motion. Develop a comfortably paced rhythm like you are beating on a drum – one that is not too fast as to tire the muscles in your arms quickly, but with enough strength so that the herbs do get crushed. 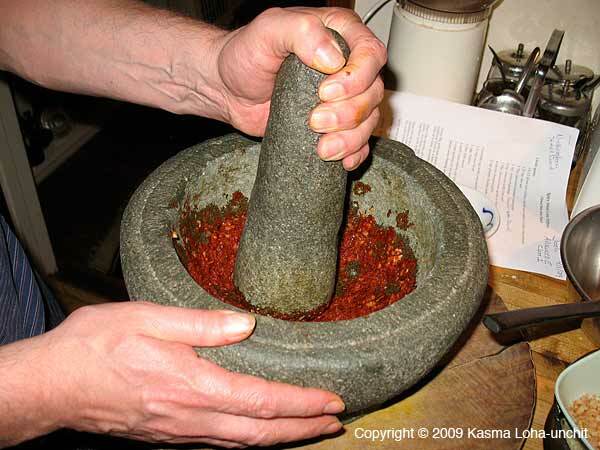 Move the herbs around with the pestle so that a single layer is pounded at a time to maximize the efficiency of the hard pestle beating against the hard surface of the mortar. When it is reduced, push it aside and move uncrushed pieces to the center to be worked, and so on. Just because the mortar is large doesn’t mean that you can pound and reduce a lot of herbs at a time. For fibrous herbs, too thick a bed of them can actually take longer and require more energy from you to reduce, as the pieces cushion one another. For quicker results, pound a small amount at a time, removing the crushed herbs before adding more to be crushed. When all the ingredients have been reduced, combine them and pound together until they become a uniform, well-blended paste. Besides the two types of mortar and pestle mentioned above, I have a small, carved stone set which I use only for quick-grinding of small, dry seeds, such as coriander and cumin. It works much better than the coffee grinder for pulverizing small quantities. 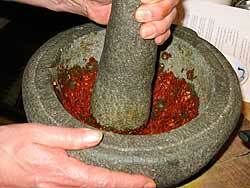 Simply roll the pestle around the mortar, applying enough pressure as you do to crush the seeds into powder. The small, Japanese-style, terra-cotta bowl with ridges inside, which comes with a wooden pestle, serves the same purpose, and is not meant to be used for reducing fibrous herbs to paste. 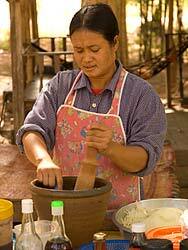 There are also wooden mortar and pestles, which are used mainly for making dishes such as Green Papaya Salad (Som Dtam). Originally in Kasma’s book, Dancing Shrimp: Favorite Thai Recipes for Seafood. 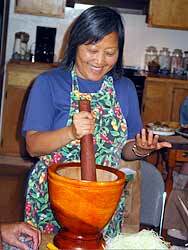 Another article on the website about the mortar and pestle is Making a Curry Paste from Scratch. 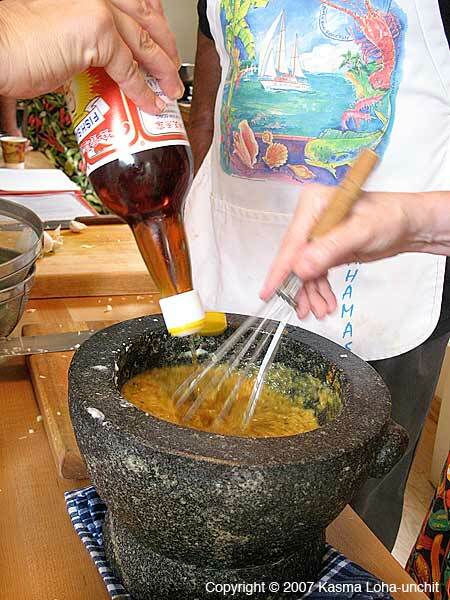 See especially Tips on Equipment and Techniques.The recipe index has many recipes that use the mortar and pestle. 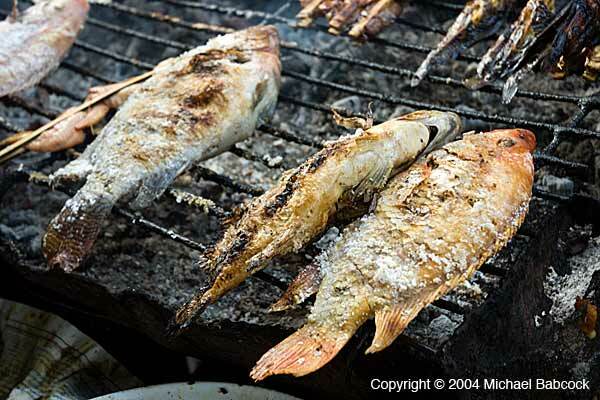 This is a picture of three fish being grilled in Nong Kai in Northeastern Thailand (Isahn). Prior to grilling, they have been stuffed with an herb mixture and then the (unscaled) fish is covered with salt. 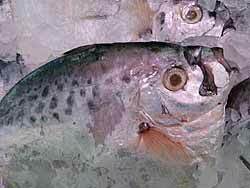 The result is a succulent, moist fish with herb flavor that is simply delicious. One of the great joys of traveling in Thailand is going to the open-air and local markets. One of the joys of going to the markets is seeing all kinds of appetizing and wonderful food that you never knew existed. Kasma teaches her version of this recipe as Charcoal-Grilled Salt-Encrusted Fish Stuffed with Crushed Herbs, Served with Hot Thai Chilli-Lime Sauce (Bplah Yad Sai Samunplai Pao) in her weekend Advanced Series Set E (class 1). You are currently browsing the Thai Food and Travel Blog blog archives for May, 2009.